Photo of the Louvre from Matt Biddulph on Flickr. 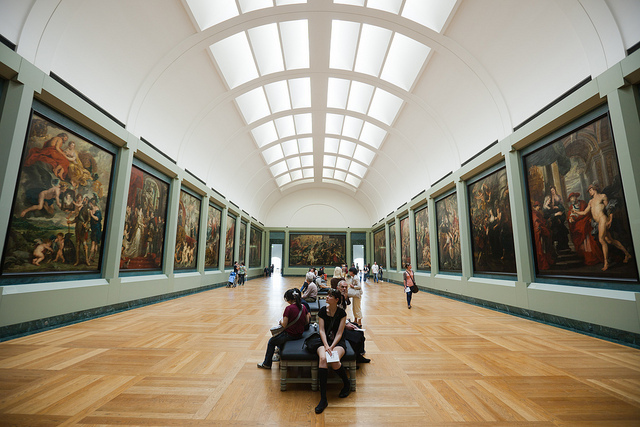 There are many, many museums here in Paris—about 150 of them. Unless you’re a total museum addict, it’s probably best to choose a couple based on your interests, especially if you’re only in Paris for a few days. The Paris Museum Pass website is a good place to start. It lists the various museums and monuments, and provides lots of information alongside an interactive map. The site also sells a Museum Pass, which costs 39 euros for two days of unlimited museum-ing. If you only plan to check out a couple of museums, however, it probably isn’t worth it. Just go to the individual museum’s websites to purchase advance tickets. Note: Admission to most museums is free to those under the age of 18, and totally free on the 1st Sunday of each month. Housed in the train station contracted for the 1900 World Fair, the Musée d'Orsay focuses on art from 1848 to 1914. Here you’ll find works by greats like Bonnard, Carpeaux, Cézanne, Courbet, Daumier, Degas, Gallé, Gauguin, Guimard, Lalique, Maillol, Manet, Millet, Monet, Pissarro, Redon, Renoir, Rodin, Seurat, Sisley, van Gogh, Vuillard and others. On the top floor, you’ll find a spectacular “Kodak moment”: two massive clock faces overlook the Seine and Sacré Coeur on the hill. Take a photo through the clock face for a unique angle and a sweeping view. Admission: 9 euros adults / 6.50 euros 18-25 year-olds. Under age 18 is free. Plan to see the Musée Rodin on the same day? For 15 euros, you can a pass to see both. Book online. What can we say about the Louvre that hasn’t been said? Some of humanity’s most important artistic creations are housed here, including the Mona Lisa and the Venus de Milo. Hours: The Louvre is open every day (except Tuesday) from 9 a.m. to 6 p.m., and until 9:45 p.m. on Wednesdays and Fridays. Admission: On-line tickets - save waiting in lines! The Musée Luxembourg is one of Paris’s oldest museums—it was commissioned by Marie de Medici in the early 17th century. Today, it houses masterpieces by artists like Botticelli, Raphaël, Titian, Gauguin, and Matisse, and is accompanied by 60 acres of gardens featuring an orangery, a fruit garden, and many trees, flowering shrubs and fountains. Hours: Open every day from 10 a.m. - 7.30 p.m. (10 p.m. Fridays and Mondays). Admission: 11 euros for adults / 7.50 euros for young people aged 16-25 / free for those under 16. The Musée Rodin is housed in a mansion built between 1727 and 1732, formerly called the Hôtel Peyrenc de Moras and now known as the Hôtel Biron. From 1911 onwards, sculptor Auguste Rodin occupied the entire mansion, which was then owned by the French government. After he donated several of his sculptures, the building was named for him—Musée Rodin—and Rodin became the manager of the collection. Nearly 300 works from Rodin's collection are on view in this mansion, which features classical architecture adorned by rocaille decoration. Both the house and the garden are worth a visit. Hours: Open daily except 1st Jan, 1st May & 25th Dec, from 10 a.m. to 4:45 p.m. On Wednesdays the museum is open until 8:45 p.m. and the gardens until 11 p.m.
Over 50,000 military objects are on display in this museum, and “the golden dome” [Eglise di Dôme] houses the tomb of Napoleon 1, his son, and other famous military figures. There are also an exhibit and multimedia show about General Charles de Gaulle [this part is closed on Mondays]. Hours: 10 a.m. – 6 p.m. from April 1 to Sep 30; 10 a.m.— 5 p.m. from Oct 1 to Mar 31. Late opening until 9 p.m. on Tuesdays from April to September. Closed on Jan 1, on May 1 and on Dec 25. Admission: Approximately 10 euros; see detail. It’s always best to buy in advance online.